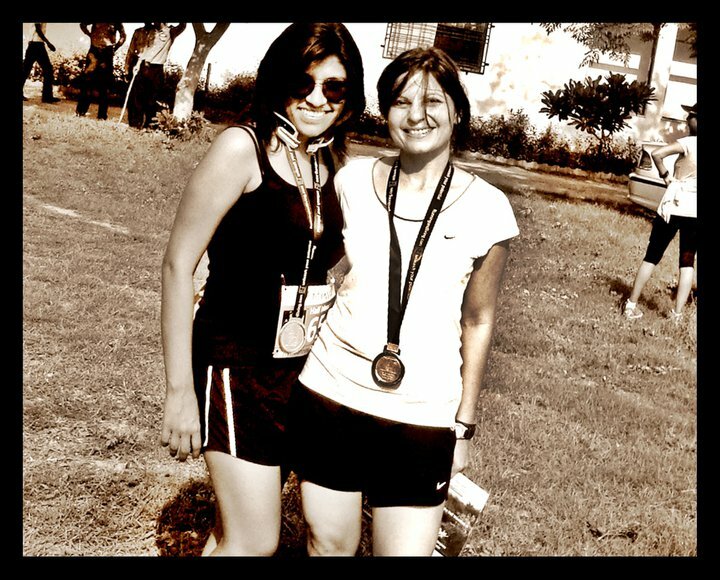 Prep for your first 5K/10K with Tanuja Sodhi! 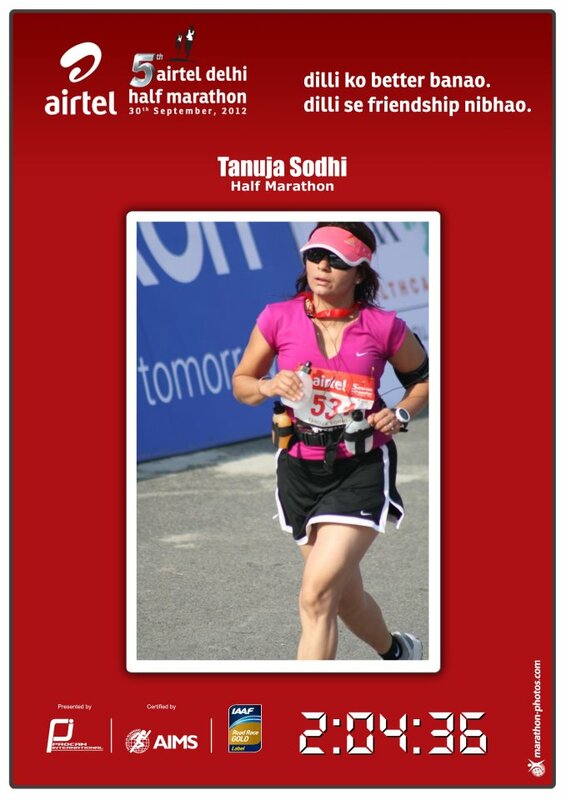 So, if you have recently started running or intend hitting your first 5K or 10K – here’s the city’s poster girl for running & all things fit, Lt.Tanuja Sodhi (Ex Indian Naval Officer) answering common beginner queries for a great run! 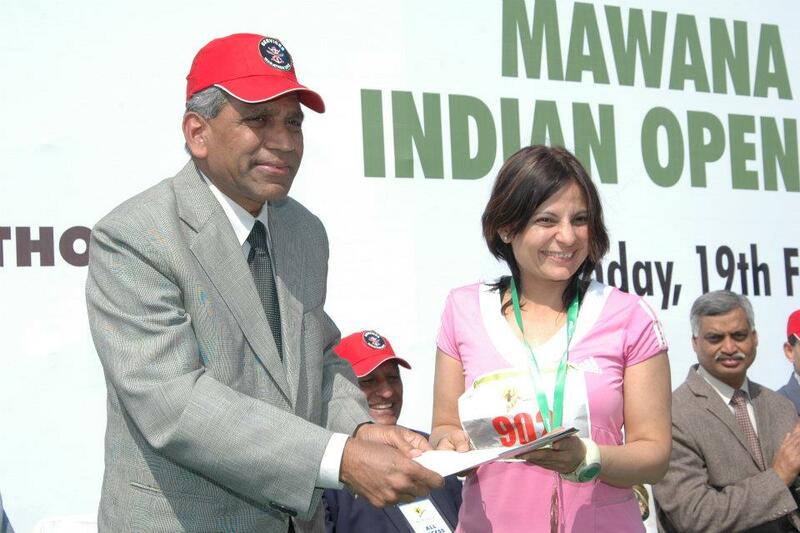 A well-known Nutrition & Fitness consultant, she also recently aced the Bhatti Mines Ultra Marathon (50K), standing first among women runners. 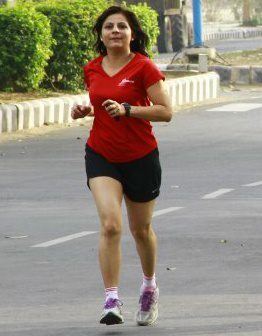 She was also adjudged the Runner of the Year 2012 & 2013 (female) in the NCR region. Here’s a boot camp of sorts with the running guru! Warm up & Cool Down Always start with a short 5-7 minutes Aerobic warm up to loosen up your muscles, to avoid injuries and to warm you up for your run. Then start with an easy jog and gradually build up your speed. Always cool down with stretches post-run.Stretch your leg & arm muscles to bring them back to their original length from a contracted state. This reduces risk of injuries. NL suggests a look at the 6 Best Stretching Exercises for Runners . Start Slow & Run in good form Too much too soon is a recipe for disaster. It’s essential to ease yourself into running slowly, increasing your pace and distance gradually. For beginners, a ‘walk & run’ schedule works well- begin with relaxed & easy strides, building up to running slowly. Ensure proper running form by keeping the upper body tall yet relaxed, striking the ground with the mid-foot landing under the hip, and swinging the arms forward and back. 2-3 Strength-Training sessions a week for your lower body and core strength will strengthen bones, ligaments, tendons, and muscles for an injury-free run. It also prevents early burn out. Moves like lunges, leg curls, squats, crunches, etc will help you to improve your running skills. Yoga in your training schedule helps with increased flexibility, boosts speed and prevents injury. LOOKING COOL AT THE RUN IS GREAT, BUT CORRECT RUNNING GEAR IS ESSENTIAL! Invest in well-fitting Running Shoes with good support to arch and heel & enough cushioning to make running comfortable. Don’t buy shoes only for their aesthetic appeal! Your heel should fit snug, but not too tight on lacing up to avoid blisters and black toenails. You should be able to wiggle your toes in the shoe’s forefoot. The shoe should not be too narrow, or else you’ll get blisters on your little toe. Walk/jog around the store to test the fit. Take a look at Nike, Adidas, Asics. Always buy shoes in the evening as our feet start swelling in the morning till around 4 p.m. Wear comfortable T-shirt, shorts/leggings/tracks that are sweat-absorbent. For women runners, a good, supportive sports bra that fits properly is an absolute essential. Wear synthetic blended running socks to help prevent blisters. If you take up running on a regular basis and the harsh sun is not exactly your best friend, you could invest in the running gear like a sweat-wicking running cap (Check out Nike, Adidas and Reebok sell these with different names. Nike has Dry-Fit, Adidas has Climacool and Reebok has PlayDry Technology),UV blocking sunglasses, a sweat-absorbent bandana/sweat-band etc. Carry a refillable water bottle and some money tucked away (just in case).Gadgets especially heart-rate monitors, GPS watches, armbands, etc are not at all essential but if you just have to, take along an iPod/MP3 Player for music to motivate and a waist pouch to keep your phone, keys, wet wipes, etc. SO, YOUR TOENAILS & SKIN LOOK A HORROR,POST-RUN? SHOW THEM SOME TLC! Avoid bruised toenails (due to slamming the shoe front repetitively) by wearing well-fitting shoes that have adequate toe space, avoid excessive downhill running, wear synthetic blended socks to wick sweat & reduce slippage and trim nails regularly. Protect your skin with a waterproof/water-resistant sunscreen (Min. SPF 30) & which protects against both UVA & UVB rays. Apply the sunscreen 20 minutes before heading out. Banana Boat Ultra Mist Sport Performance Continuous Spray is a favorite amidst runners around the world. (This could be picked up on the way when travelling oversees or through online shopping sites such as: amazon.com, shopping.rediff.com, flipkart.com and jungle.com). Neutrogena and Kiehl’s (Promenade, Vasant Kunj) sunscreens is a good alternative available locally. Use a moisturizer/petroleum jelly/foot cream every day immediately after a bath when the skin is soft and absorbent, to prevent blisters.Avoid wearing damp socks, to prevent fungal infections. Soak your feet in cold water immediately post- run or apply ice packs if your feet swell up or get overheated when you run. You may add salt to the water for the soak.A Pedicure will take care of broken skin, broken nails, blisters, and calluses. Get a foot massage/foot reflexology to relax tired and swollen feet and legs. Runners need a balanced diet, rich in complex carbs to fuel them and protein rich foods to strengthen their muscles. The other nutrients are good fats, fiber and enough hydration. Almonds and walnuts, dry fruits, trail mix, eggs, sweet potato, oats in skimmed milk, fruits like oranges, banana and sweet lime, fish like tuna, salmon, sardines; lean chicken breast, dal sprouts, legumes and lentils, lean dairy like low fat milk, curd, buttermilk, green salads, whole wheat bread or roti, etc – are excellent sources for healthy carbs & proteins. Some great snacks pre /post run include – Banana, apple, pear, cereal with milk, low fat cheese slice open sandwich with wholegrain bread slice, dried plums, dried dates, apricots, figs, trail mix, mixed nuts (almonds, walnuts & raisins), fruit yogurt, whole wheat slice with peanut butter, boiled sweet potato, medium calorie energy bar, etc. Joining a new running group/club helps you make new friends and is a great stress buster & you are likely to find running buddies who have a similar speed and hence you can train together.Running clubs/ running groups keep new runners motivated with training sessions or exchange of unique running experiences. You will also get a pool of ideas on how to run, train, etc and keep you updated on the buzz around running events. Running with others can give you a great boost on longer runs and it’s also safer than training alone. Running in a group inculcates competitive spirit. This in turn will push you to test your limits and improve your performance. Look for a running group in your vicinity so that it’s easier for you to train with it. Find a group that is an amalgam of all kinds of runners- slow, fast, short distance, long distance, etc. This will help you test your abilities and help you decide what kind of runner you could shape into. You could enquire about this group through friends, various Google groups or through social media. There are many running groups formed on Facebook in each city. Get to know Tanuja Sodhi: Tanuja was one of the 22 ladies selected for the first batch of lady officers in the Indian Navy, holds a Fellowship in Applied Nutrition from Apollo Hospitals and a Reebok Certification in Fitness. Further, she is an MBA (HR) from Jamnalal Bajaj Institute of Management Studies, Mumbai. Today, Lt.Tanuja Sodhi is as a well-known diet & fitness consultant & has conducted workshops on the subject with top corporates including Nestle, Coca Cola, Airtel, JP Morgan Chase Bank, NTT DATA, etc. Proficient at running, strength training, swimming, yoga, aerobics, high intensity boot camps, etc, she is well known in the city’s fitness circuit as a running force unparalleled. For Nutrition & Fitness Consultation/Training, reach Tanuja Sodhi at 09871588662 or email at tanujasodhi@gmail.com. Got a question on running/fitness? Post in the comments below for an answer! Run, move, sweat & stay Naturally Lush! Next Post3 cool joints to get your Fro-Yo fix !